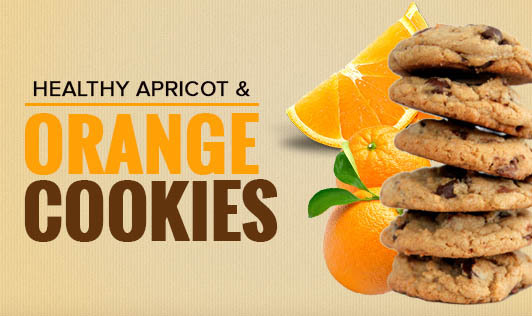 Try these healthy soft crunchy cookies recipe made with whole wheat flour, apricot and orange. • Pre-heat the Oven at 160 degree Celsius. • Take ¾ cup of wheat flour in a bowl. • Add baking soda and baking powder in the wheat flour and sift it thrice and keep aside. • Add dried apricots, cashews, orange juice, orange zest, butter and milk to the wheat flour. • Mix all the ingredients together in a bowl and knead to make soft dough. • Pour the dough into a piping bag fitted with an outsized nozzle. • Pipe out 1 ½ " diameter cookies on the greased baking tray. • Bake the cookies in the oven for twenty to twenty five minutes or until the cookies are golden brown in color. • Cool and store them in an air tight container. Note: If you are diabetic, you can use artificial sweetener instead of sugar to make them sugar free.